Kellen B. Winslow will be the keynote speaker at the 2014 PABG Franchise & Investors Show. Member of the Pro Football Hall of Fame, Class of 1995; member of the NFL All-Time Team, celebrating 75 years of NFL history; All-Pro, Consensus Collegiate All-American and inducted into the College Football Hall of Fame, Class of 2002, Kellen Winslow is said to be the player who defined the tight end position for the rest of pro football to follow. Kellen was born November 5, 1957 in East St. Louis, Illinois. He began playing football during his senior year at East St. Louis Senior High School. In 1975, Kellen was awarded a football scholarship to the University of Missouri, Columbia. In 1978 he was named Big Eight Player of the Year for his academic and athletic achievements and earned consensus All-American honors. He was the 13th player selected in the first round of the 1979 NFL draft by the San Diego Chargers. Kellen enjoyed a nine-year career with the Chargers; earning All-Pro honors five times and setting both team and league records that stand to this day. A firm believer in that academics and athletics go hand in hand, Kellen graduated from the University of Missouri receiving a Bachelor of Educational Science in Counseling Psychology. He returned to school after his football career and earned his Jurist Doctorate from the University of San Diego School of Law in 1993. Kellen continued to parallel his athletic accomplishments with a successful career in the media. He worked as an analyst for Fox Sports Net College Football Saturday Studio Show alongside ‘The Insider’s” Kevin Frazier. In past years, Kellen has provided color commentary for NFL broadcasts on CBS Radio, ESPN college football and for University of Missouri football. Kellen has appeared on ESPN, Fox Sports, “Politically Incorrect” and most major local and national radio and television sports programs. He is often called upon to speak on social, political, economic and racial issues related to sports. 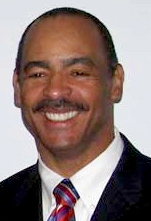 He has served as the Executive Director of the Fritz Pollard Alliance, an affinity group made up of minority members of the National Football League front office, coaching and scouting personnel and as the Director of Planning and New Event Development for the Walt Disney World Sports Complex in Orlando, Florida. After a five-year stint in collegiate athletic administration, Mr. Winslow has returned to his love of public speaking and writing. Kellen is an insightful, motivating and thought provoking speaker covering a wide range of topics.